This necklace contains an 11mm Tahitian Black Pearl and a 9.5 mm White Pearl set in 18K Gold with 10 diamonds at .38 CTS. The pearls are excellent luster with the pendant on a woven cord. Aquaria Brooch – Do you want to light up the room? The Aquaria Brooch sparkles with iridescent blue and pink sapphires and 77 diamonds. 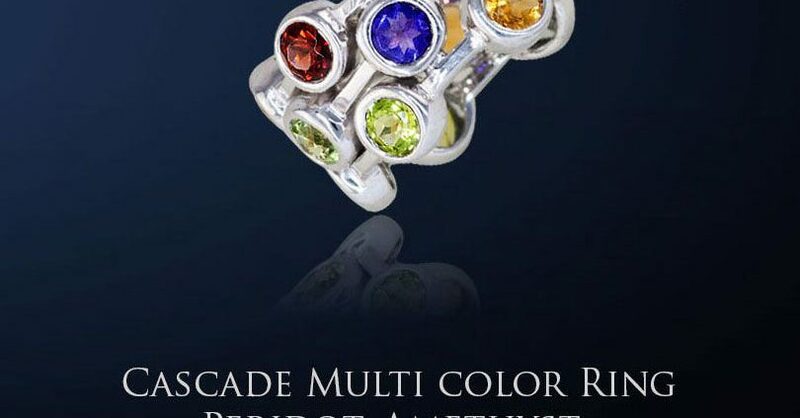 Inspired by the tropics, this playfully chic accessory brings the sea to you, and will revitalize your senses with its lush and radiating spectrum of glistening jewels. 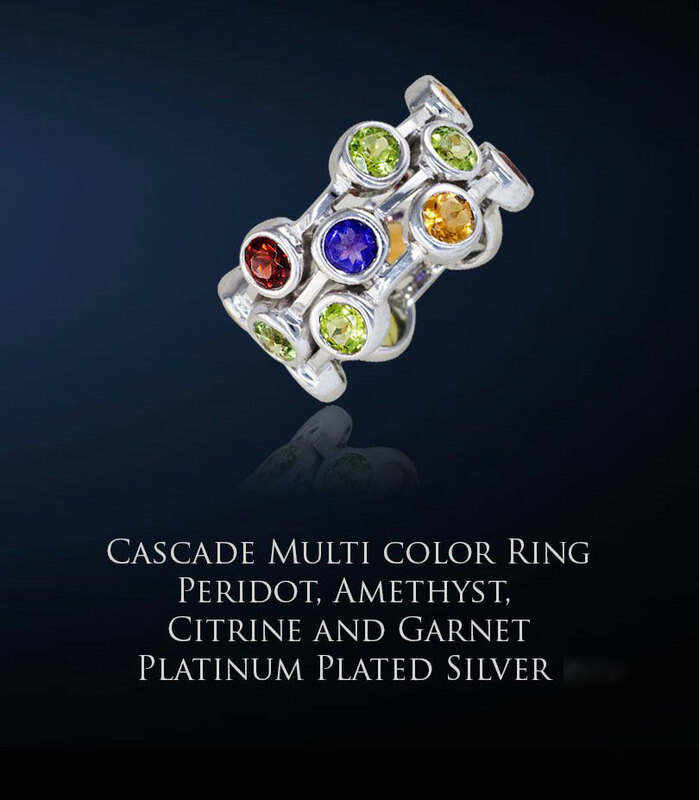 Cascade Multi Color Ring – Peridot, Amethyst, Citrine, and Garnet with Platinum Plating. Triple Cascade Diamond Earrings with a Multi Gemstone Cascade Necklace in 18K Gold. 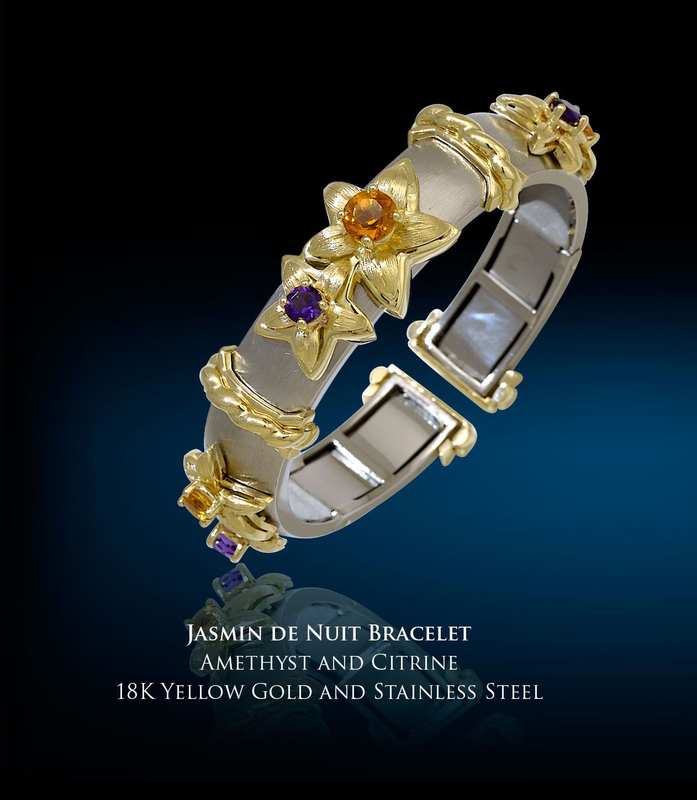 Jasmine de Nuit Bracelet – Amethyst and Citrine set in 18K Yellow Gold and Stainless Steel. 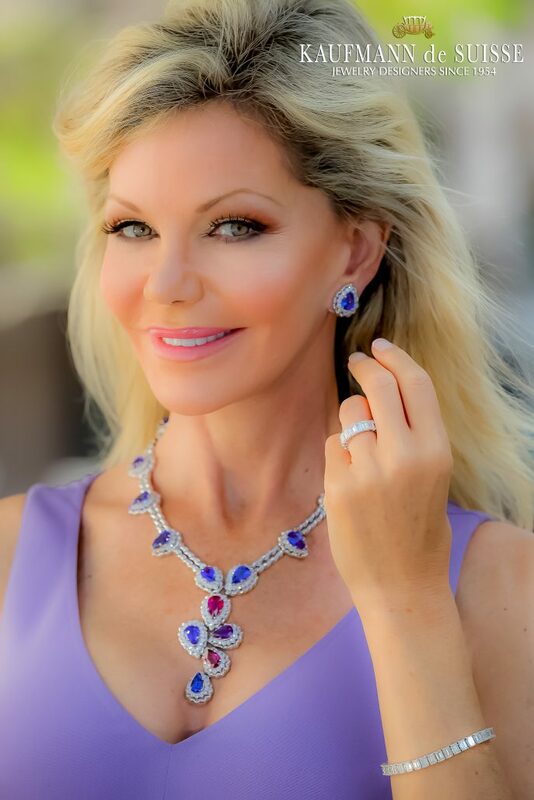 Tanzanite and Diamond Necklace, Handmade in 18k White Gold with 14 Pear Tanzanites Weighing 56 Carats Total and 250 Round Diamonds Weighing 17.50 Carats Total and Accented with 1 Rhodolite, 1 Rubelite and 1 Amethyst. Aphrodite’s Charm/ Freya – The Norse goddess of love and beauty, Freya has been confused with Aphrodite for centuries. While both are fixed icons in their respective cultures, Freya is believed to be the more powerful of the two. Part of the Flowing Lines Collection, the Freya Necklace demonstrates this authority with its classic elegance and demand for attention. Immerse yourself in the reverie of the gods with this effortless piece that captures the enchantment of the divine. Flowing Lines Pink Tourmaline Ring – 1 Pink Tourmaline 2.08 CTS set in Argentium Silver. Handmade Freshwater Grey & White Pearl Bracelets & Necklace from Kaufmann de Suisse Jewelers.